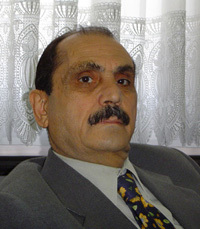 Dressed very smartly in a black suit and a pale pink shirt, Hamid (not his real name) started to tell the story of how he fled Iran in 1990 due to his political activities and lived in northern Iraq until 2002. As he talked he was interrupted by a mobile phone call. He quickly answered and got the caller to call back later. It's not the usual image of a refugee in desperate circumstances, but it's now common among Iranian refugees in the southeastern Turkish city of Van who say it's important to be contactable in case they receive news on resettlement in a third country, their ultimate dream. They also need to keep in touch with other refugees on issues affecting their community, including protection. Hamid was a member of an opposition party in neighbouring Iran and said he had to leave in fear of his life. The move to Turkey in 2002 meant a tough transition. "I paid a smuggler US $1,000 to help me get across the border into Turkey with my wife and two children," he told IRIN in Van. He is one of 1,200 Iranians previously living in northern Iraq now in the ancient southeastern city, set some 1,700 metres above sea level with a centuries old citadel. Another 600 Iranians entered Turkey directly from Iran. The refugees moved to Turkey over a number of years from 1998, due to restrictions imposed by Baghdad, which meant that they were accepted as refugees but those residing in northern Iraq, during Saddam Hussein's rule, could not get exit permits to leave the country. Therefore, in search of access to resettlement, they travelled to Turkey. There are an estimated 6,000 to 7,000 Iranian refugees in Iraq. The Iranians from northern Iraq in Van are a distinct group because they transited a country of asylum en route to Turkey. Prior to the war, for many of these individuals, northern Iraq was generally a safe place of asylum. While there had been some dispute over their status, Ankara has since allowed this group of people the right to be moved to other "satellite cities", to be spread across a total of 16 central Anatolian cities, giving them the right to work. Under an agreement proposed in November 2003 and signed in April 2004, the 1,200 Iranian refugees from northern Iraq have already started moving to other Turkish cities to begin a new life with a third of the caseload already having left Van. They are issued vouchers by the office of the United Nations High Commissioner for Refugees (UNHCR) enabling them to receive free bus tickets to their allocated city. They also receive some financial assistance, depending on the size of the family, to help them get started and are granted residence, under law number 5683 for foreigners travelling and residing in Turkey, and must obtain work permits in compliance with the provisions of law number 4817. 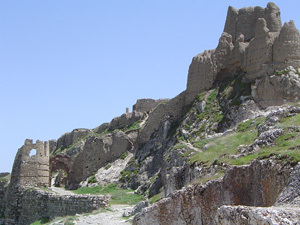 [Iraq] The city of Van is home to centuries old Citadel. "I picked up my voucher from the UN yesterday. They gave me these documents," Hamid told IRIN in Van, as he waved some pieces of paper containing details of his family members and photos. "Life is tough here, I haven't really been able to work and have only done the odd job," he explained, adding that his wife was volunteering at the Turkish Educational Volunteers Foundation (TEGV) which has allowed refugee children and refugee volunteer teachers to participate in the programme. "I'm being moved to Cankiri [131 km from the capital, Ankara]. I really don't know what it's going to be like there and I don't even know where we are going to live, but I hope I can find work," he said, sighing hopelessly. Another Iranian refugee, formerly living in the Al-Tash camp in northern Iraq bordering Iran, was more optimistic about his move. The young man, dressed in jeans and a T-shirt, was clearly proud of his fluency in English and said he was looking forward to moving. "I've been told I'm going to Kutahya and I think it's good that we are being looked after," he told IRIN. Originally from the northwestern province of Kermanshah in Iran, which borders Iraq, he lived with his family for 20 years in the Al-Tash camp. "We were living in mud houses there too often with no electricity," he said, adding that the only water nearby was in the Euphrates River. "We used to survive by selling goods to Arab villages," he explained. "I heard that the situation in Iraq was going to worsen so I made plans for me and my family. Smugglers who spoke Kurdish brought me over the border, charging US $350 per person. My family went home to Iran but I could not return as I belong to a political party," he said. When he entered Van he said he went to UNHCR and the police to register, a condition to be carried out within 10 days of arrival if you want to seek asylum in the country. "I am not able to work so my family sold our land to pay for me to stay here," he added. Although Iranians in Turkey are looking forward to being able to work legally in the country, the move is not without complications. Some refugees have complained of having to pay huge amounts of money - up to $1,000 for a family of six - for a residence permit. UNHCR says it is seeking to negotiate this with the authorities, trying to have the fee reduced where possible under Turkish law. Legally, the fee cannot be waived and with refugees only able to earn up to US $15 per day, many cannot pay the fee immediately. "The main issue for the UN is safe arrival and accommodation of the refugees and the situation is being monitored," the head of the UNHCR office in Van, Carolyn Ennis, told IRIN. "The refugees are often brought in by smugglers who have made big business out of them, but they are often abused by them and are scared of them," she added. [Iraq] The spectacular Van lake, a few kilometres away from where the refugees live. The local authorities say the new refugee agreement is best all round. "They cannot work so there are problems for us. They get involved in crimes such as burglaries and even some murders," the Governor of Van, Hikmet Tan, told IRIN. "They are jobless and they need work to survive and support their families, but they can't work here so the move will give them better opportunities," he added. "Normally we don't accept such refugees, but we know that they cannot return home so we accepted them," Tan explained. "We want them to move on to Europe, but this is a slow process and we want it to be speeded up," he stressed, adding that the Iranians did, however, have the right to education in Turkey. UNHCR has worked closely with TEGV and many refugee children have been able to attend the school in addition to those already attending Turkish public schools. The refugee population in Van, including the Iranians, stood at 2,740 at the end of March. 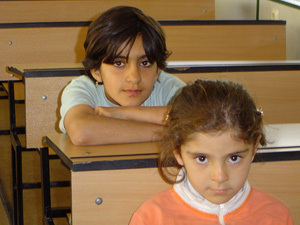 In the year 2000, with TEGV already admitting hundreds of local children, also agreed to accept refugee children between the ages of seven and 15, along with 10 volunteer refugee teachers, but that was now down to 26 children and four teachers, following the transfer of Iranians from Iraq to satellite cities. Sitting in the busy headquarters of Van police station, the head of the Aliens Department in the city, Tayfun Bora, outlined some concerns he had. The burly man, dressed in a smart navy blue uniform with a pistol strapped to his trouser belt and golden crests on his shoulders depicting his seniority, said the situation of refugees was far better now than three years ago. "There used to be around 3,000 and now there are now about 2,000. We thought there would be a movement of thousands following the war but this did not happen," he told IRIN. "There was a case some time ago where an Iranian killed a police officer and a local person was found dead in a canal. Following investigations it was found that an Iranian refugee was the culprit, so there are some concerns," he said. "They are not living in an isolated place and we are not pushy on their work situation. We know they have to survive and make ends meet," he said, referring to those working illegally in Van city. Additionally, refugees and asylum seekers are given financial assistance from UNHCR depending on the size of the family. Many are also receiving assistance from relatives in Iran such as flour, oil and sugar, brought over the border by bus drivers. [Iraq] Governor of Van, Mr Hikmet Tan says the Iranian refugees will have better opportunities in the satellite cities. Turkey is a signatory to the Convention for Refugees, but does not grant asylum to those coming from the east. However, UNHCR has undertaken to seek resettlement on behalf of those asylum seekers who enter Turkey through its eastern borders and who are recognised refugees. Under current Turkish refugee law, all refugees entering the country should register with the police within 10 days or they lose the right to be able to seek asylum. Under Article 33 of the Convention on Refugees, Iranian refugees must not be forced to return to the country where they claim fear of persecution. In addition, UNHCR is calling on governments not to repatriate refugees from Iraq due to poor security. Those who enter Turkey illegally generally cross the borders with smugglers without documents and are required under the law of the land to register in the border province where they entered. 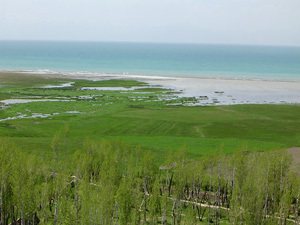 Most are registered in Van, and in the neighbouring provinces of Agri and Hakkari. Once the refugees register with the UN agency, every effort is made to get a decision on their status as soon as possible. Those who are recognised as refugees in accordance with UNHCR's Statute and the 1951 Convention on Refugees are submitted to resettlement countries, while those whose applications are rejected may appeal the decision. "We try and resolve a case within four months," Ennis said. [Iraq] Refugee children are able to continue studies at TEGV. "Those refugees who have been around for several years have in many instances had their case closed but have not moved on yet after the authorities have served a notice to them following appeal," she added. The UNHCR official explained that there had been recent reports that two groups of Iranian refugees were deported but was unable to confirm this, adding that local police were trying to refer cases but were also working under difficult circumstances. While official estimates indicate that as many as 70,000 migrants seeking to travel to western destinations may transit Turkey annually, the caseload of refugees and asylum seekers averaging roughly around 4,000 annually represents a very small percentage of the overall number of persons entering and travelling through the vast country. "UNHCR is seeking to assist the authorities in identifying and providing protection to the asylum seekers and refugees who may enter Turkey in the same manner as the migrants but who are in need of international protection," Ennis added. Back at the TEGV school, refugees who've had a tough time say all they want is to be able to live a normal life again. "It took me a long time to find friends here and speak the language," Karima, a 17-year-old girl with sculptured features and big brown eyes, told IRIN, in a shaky voice as she reminisced the trauma she had encountered in moving from country to country. "Its been a hard life," she said as her lip quivered and she burst into uncontrollable tears with her sobbing mother comforting her. "We've been through a lot and we want to move abroad now," she added.